The USCG flag and medal display frame designed to resemble the blue,white and red stripe of a Coast Guard Cutter along with the boat flag added showing the USCG sheild. 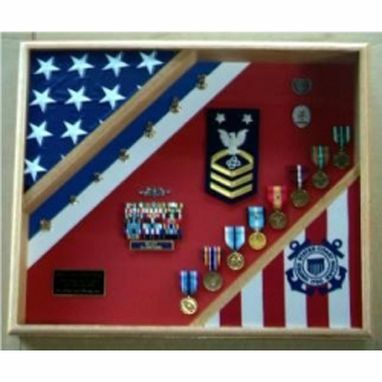 The USCG flag and medal display frame is perfect size case for a large amount of memorabilia. This case is available in either Red Oak, Walnut or Cherry and comes with a red, black, blue or green backround. Holds two 3'x5' flags. Mounting backet is included. Outside dimensions are 19.5" x 21.5".